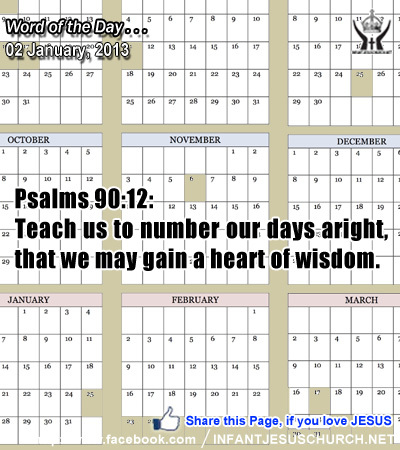 Psalms 90:12: Teach us to number our days aright, that we may gain a heart of wisdom. Heavenly Father, we confess that so often we leave not done what needs to be done. Please help us see your plans in each of our days and live in a way which not only honors you, but also blesses those you want us to reach. In Infant Jesus' name we pray. Amen. 19And this is the testimony of John, when the Jews sent priests and Levites from Jerusalem to ask him, "Who are you?" 20He confessed, he did not deny, but confessed, "I am not the Christ." 21And they asked him, "What then? Are you Elijah?" He said, "I am not." "Are you the prophet?" And he answered, "No." 22They said to him then, "Who are you? Let us have an answer for those who sent us. What do you say about yourself?" 23He said, "I am the voice of one crying in the wilderness, `Make straight the way of the Lord,' as the prophet Isaiah said." 24Now they had been sent from the Pharisees. 25They asked him, "Then why are you baptizing, if you are neither the Christ, nor Elijah, nor the prophet?" 26John answered them, "I baptize with water; but among you stands one whom you do not know, 27even he who comes after me, the thong of whose sandal I am not worthy to untie." 28This took place in Bethany beyond the Jordan, where John was baptizing. John saw from a distance what the Messiah came to achieve - our redemption from slavery to sin and our acceptance as sons and daughters of God, our heavenly Father. He was the most of the prophets, yet he lived as a modest and faithful servant of God. He pointed others to Jesus, the Messiah and Savior of the world. The Christian church from the earliest of times has known John many titles which mean his prophetic mission: Witness of the Lord, Trumpet of Heaven, Forerunner of the Redeemer, Preparer of Salvation, Herald of Jesus, Voice of the Word, Precursor of Truth, Friend of the Bridegroom, Crown of the Prophets, Light of the Martyrs, and Servant of the Word etc,. Do we point others to Jesus by the testimony of your witness and example? Loving Infant Jesus, make us a herald of your word of truth and grace. Help us to be a faithful witness of the joy of the gospel and to point others to you as John did through his testimony.